If you follow Fox News I'd like to ask you a few questions. Me: Why do you watch Fox News? Follower: For fair and balanced news coverage. Me: I see. 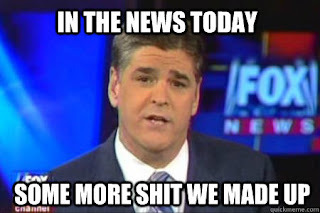 Like Sean Hannity? Me: Here's the latest in Fox News embarrassment about Sean Hannity. Me: What do you like about Fox News? Me: Oh, I see. What about former Fox news host Andrea Tantaros? Me: She's sueing former network chief Roger Ailes and other top executives for sexual harassment - a poor reflection on family values don't you think? Follower: I didn't hear about that. Are you sure that's true? Me: Go to a real news channel and you'll see. You might even pick up a newspaper. Me: What do you think about Global Warming? Follower: It's a liberal hoax. Me: A Standford University study has found "more exposure to Fox News was associated with more rejection of many mainstream scientists' claims about global warming, and with less trust for scientists." Follower: I don't trust scientists' because they're all liberals. Me: All of them? Climatologists and scientists? Follower: No doubt about it. Fox says it's so. Me: Okay. Thanks for stopping by.